On this Mother’s Day, let us honor the Mother of the World. 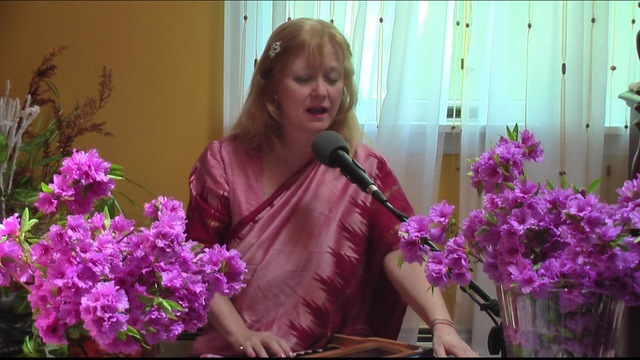 The very first bhajan I learned in carnatic singing class was Maha Lakshmi. I can still remember being intrigued by it and the unusual sound of the raga, and the fact that the bhajan did not start on the Sa of the raga but on the Da, up the raga or scale, and a challenge to find at first. I have done my best below to provide some translation of the lyrics and the source of the bhajan, which honors the Goddess Lakshmi in Her manifestations as Ashta Lakshmi. I have also provided some excerpts from a lovely article written by Swami Adyhatananda below. Dhairya Lakshmi, “Courage Lakshmi”): Bestower of valour in battles and courage and strength for overcoming difficulties in life. 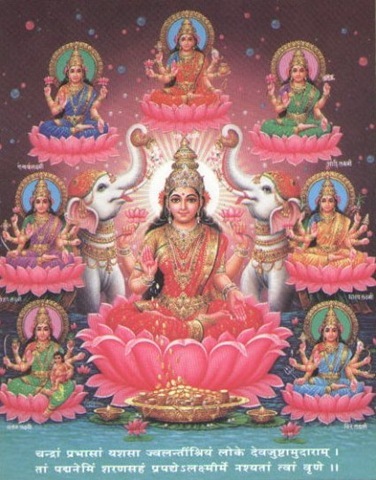 …Thus all these eightfold Sri Lakshmi is ultimately one single power only. That is Adishakti. The perennial and unchangeable, ever lasting, eternal truth or the absolute is this Supreme blessedness, the mother Adishakti. She is the origin. She is the light. She is the power, the wisdom and the strength. She is the Supreme Joy, peace, bliss and illumination.